Actually, to say skyr is here is to imply that I know when it arrived. Truth be told, I just noticed it for the first time at Whole Foods. And after being sold on the merits of the traditional Icelandic treat by guests at the ambassador of Iceland's home last year, I was eager to see what all the fuss was about. Described as a fresh cheese, skyr tastes more like yogurt and traces its roots back to the Vikings, though I have to wonder how far back the handy little collapsible spoon packaged on top goes. I picked up the vanilla version (pictured), which is sweet enough to eat as dessert. Despite being fat free, skyr is incredibly creamy — you'd swear you could be eating full fat yogurt. The texture is a little like strained Greek yogurt meets panna cotta. In case you missed the start of the Icelandic invasion, which has thus far brought Viking beer, lamb and smjor (butter) to U.S. shores, check out this Metrocurean post from last September and this New York Times article. Good tip, thanks. Looking forward to trying some. I was curious if it was sold other places besides Whole Foods but I don't know how to find the words "Where to Buy" in Icelandic on www.skyr.is! I've linked to this post and look forward to reading more! Thanks Mr. Food Markets. It sounds like Whole Foods has a special relationship with Sustainable Iceland, which is promoting all these products. So it's possible Whole Foods is the only place to find skyr right now. I've been eating those prefab WF Skyr parfaits for a few months now. They looked good and taste good. I wasn't really sure what I was eating though. Thanks for the heads up! 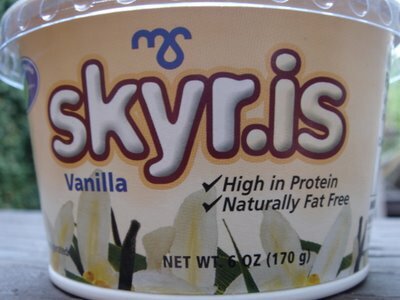 I just had some of the skyr, as well. It's AMAZING!!! does anyone know if it can be purchased any where else other than Whole Foods, now? Glad to hear it's turning up more places! I found Skyr..at WF's in June. I can't tell you how much I love all the flavors..Vanilla, Stawberry and Blueberry. I used the Vanilla to make a frozen desert!! Will they be adding more flavors?? I can't seem to get enough!